This is the second part of my account of our Viajeng Cusinang Matua tour which brought us to the old kitchens of Pampanga. You may read the first part here. From Mexico, we went to Arayat for mid morning merienda. 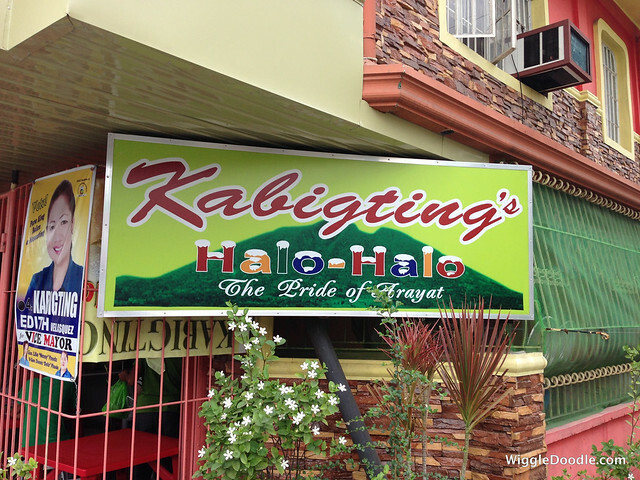 We went to an eatery called Kabigting's which is known for its version of everybody's favorite summer snack - the halohalo. The place was rather small and could fit about three to four tables. The owner was there and told us that we should have gone to their branch in a mall in another city. But of course Tracey, our guide wanted to show us where the business started. What made their halohalo different were its ingredients. The usual halohalo has a lot of contents like sweetened bananas, camote, beans, etc. 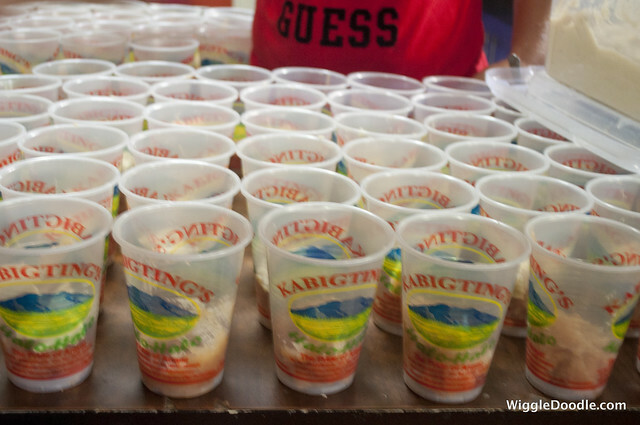 Their version has only three ingredients: pastillas made from carabao milk, the halayang white beans and sweet corn. These were then combined with the usual ice and fresh milk. Once you have mixed the concoction, the entire thing thickens, thanks to the pastillas. The result was a really thick, sweet cold treat perfect for the heat that morning. I just wish the staff were a lot friendlier because everyone seemed to be unhappy while we were there. They just passed us by with out even a glance. Finally a male staff member offered us drinking water to wash down the stuff we've just consumed. From here, we did some pasalubong shopping. I now think that it was placed on our schedule to give our tummies a break before we set out for our lunch. The halohalo was quite heavy thanks to the pastillas and beans. 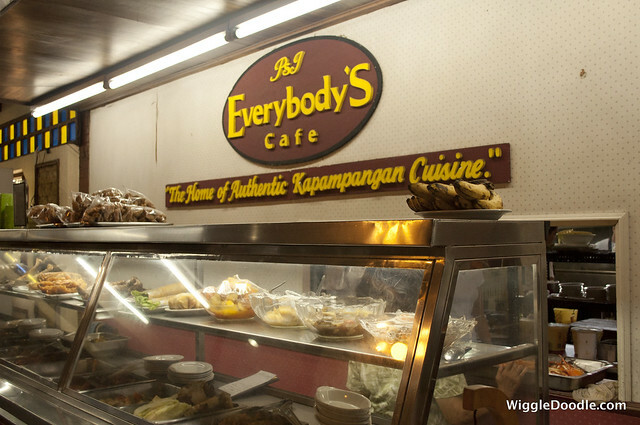 Lunch was at Everybody's Cafe in San Fernando City. The restaurant was built in the 1950s and the structure sure looked like a 1950s building. 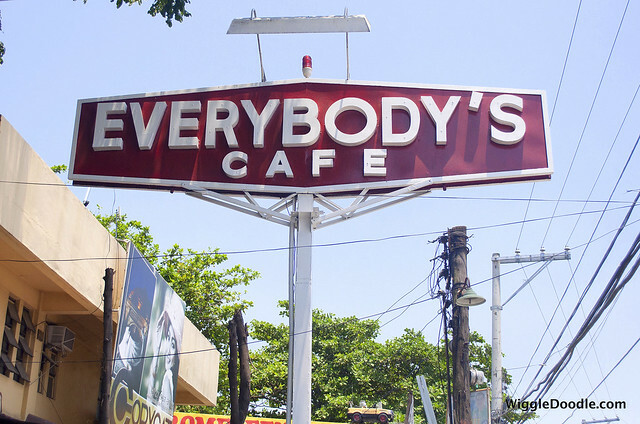 It was called Everybody's Cafe because at the time, just about anybody would go there to eat, including the American servicemen who were stationed at the Clark Air Base. The cafe has turned into a landmark and a place to get authentic Capampangan cuisine. They're well known for their stuffed betute or frogs. Unfortunately, it is off season for frogs when we went there so we didn't get to taste the frogs. Too bad because I was so looking forward to trying this exotic dish, I've tried deep fried frog legs before though. Their other specialty is the camaro salad. It's main ingredient is cricket but unlike in other eateries, the legs and wings of the insects were removed by the staff during their free time. What's left were the soft parts of the torso which was dried to crunchiness I didn't get to take a picture of the dish because it was gone in an instant. I have to admit that it was quite tasty and refreshing. Unfortunately, the cricket population in the province has been dwindling due to the industrial development there. We also ordered their other specialty, the morcon baked with chorizos and quezo de bola. It's so creamy with the melt in your mouth feel. It should be eaten with it's own drippings which you have to mix with your rice. But it looks like an embutido, though. 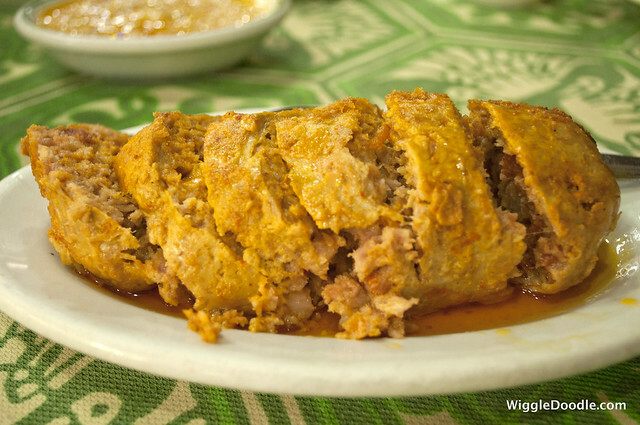 So what is a meal of Capampangan cuisine without the all-time favorite dish? Yup, I am referring to sisig! We were told however that Everybody's Cafe serves pork sisig the native way or not the sizzling sisig we all know. 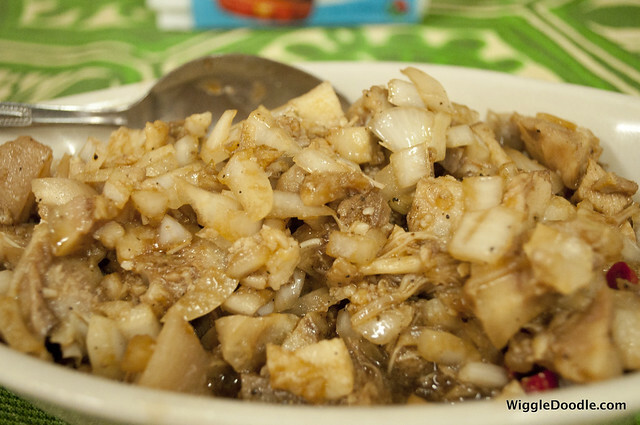 It turns out that sisig is a method of cooking, not the name of the dish much like nilaga or paksiw. So you have a sisig chicken, fish, etc. The sizzling sisig is an innovation and it was a big hit, especially for beer drinkers. The sisig we had looked like and tasted like another favorite, the tokwa't baboy but this one does not have the tokwa/tofu. After having lunch, we were met by the owner of the business. 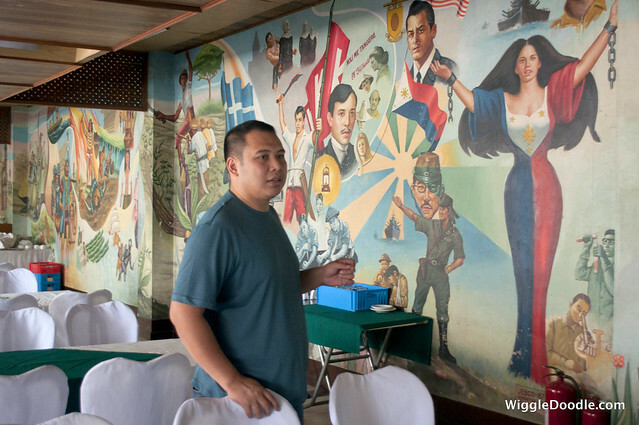 Actually Poch Jarolan is already the third generation owner and he showed us a mural inside the conference room. The painting depicts major events in the history of the Philippines. According to Poch, it was his father who commissioned a local painter to do the job in 1967. It was repainted in 1979. The original painter happened to be someone who also make billboards for movies before there was the technology to print them. So many of the historical figures in the mural bore resemblance to movie stars in the period. We had fun identifying who looked like whom. Try it for yourself from the pictures below. We bid Everybody's Cafe goodbye and proceeded to our next stop in Lubao, which was some 45 minutes away. We took the travel time to relax and snooze.